Seb Reynolds’ side are writing new chapters in their history this season and their latest triumph over Barnes means the Rams are 16 points clear at the summit with just 10 games left to play. The destination of the title may well be pointing in one direction, but the race for the play-off spot continued in Round 20. Canterbury remain in the top two after defeating Worthing Raiders, but there were also wins for their fellow promotion candidates as Taunton Titans beat London Irish Wild Geese, Henley Hawks edged past Dings Crusaders and Tonbridge Juddians saw off Bury St Edmunds. Down at the bottom, Guernsey are not giving up without a fight as the side currently in the bottom three beat Clifton on the weekend. The Raiders are now 13 points from safety while rivals Birmingham and Solihull lost to Redruth. Elsewhere, Old Redcliffians moved themselves further away trouble with a win against Old Albanian. 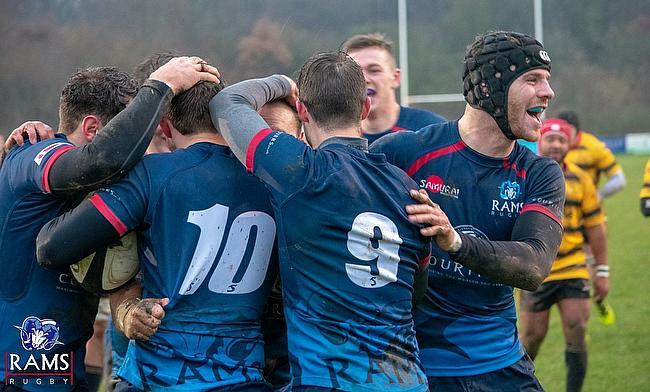 Rams RFC made it 16 wins in a row as the National Two South leaders broke their club record for consecutive victories after breezing past Barnes. Second-row Oliver Taylor and winger Conor Corrigan went over early on with Barnes replying on 34 minutes through Robbie Martey. The hosts scored from close-range via Ben Henderson just before half-time and shortly after the interval, the table toppers tightened their grip on proceedings as Andrew Humberstone latched on to Alex Seers’ tremendous kick to touch down. Ellis Jones, Tom Vooght, Miles Lloyd and Jak Rossiter added further tries as the Rams cruised to the finish line, while Barnes grabbed a consolation score through Johan Van der Poel. Canterbury achieved back to back wins to conclude January as they beat Worthing Raiders at Roundstone Lane. The City Man ran in five tries against the Raiders as Andy Pratt’s side remain in the play-off position in National Two South. However, they did find themselves behind at the break as tries from Johnathan Dawe and Matt McLean gave Worthing a 14-10 half-time lead, with JJ Murray and Aiden Moss going over for Canterbury. But, the second period belonged to the visitors as Sam Kenny, Thomas Best and Kyan Braithwaite all dotted down while Worthing could only muster up a penalty try. Taunton Titans remain one point behind second-placed Canterbury after clinching a bonus-point win over London Irish Wild Geese. Reuben Knight gave the visitors a brief lead from the tee, but tries from Max Woodward and Toby East, as well as five points from the boot of Gary Kingdom, helped Taunton to a 15-3 half-time advantage. Taunton stayed in the ascendency as East grabbed his second, but it took until the 76th minute for Freddie Fraser to add the bonus-point score as Tony Yapp’s side ensured they got their promotion bid back on track. Henley Hawks narrowly sneaked past Dings Crusaders to maintain their play-off challenge in National Two South. Dings took an early lead via Steven Plummer, but the hosts then fell behind as Roddy Giles slotted over two penalties of his own. The Crusaders immediately responded as Thomas Anderson crossed the whitewash to make it 10-6 on the hour, but the Hawks would have the final say as Marcus Lowe dotted down to leave Henley three points off second-placed Canterbury. Tonbridge Juddians secured their third win in a row as they beat Bury St Edmunds to stay six points behind the play-off place. TJs led 15-5 at half-time through tries from Murray Galbraith-Lowe and Toby May, with Jacob Bodkin crossing for the visitors who had actually controlled the opening quarter of this contest. The hosts added a third score after the break as Matt Jurevicus, but Bury struck back via Sam Bixby’s try and a penalty. However, TJs were able to seal the win with a late Tom Chapman try. Redruth secured their second consecutive home victory to lift themselves up to seventh place, despite ending their clash against Birmingham and Solihull with 14-men. The Reds started strongly and went into a 14-6 lead with Jack Simmons and Tipiloma Kivalu crossing for the home side. But the visitors fought back to head into half-time trailing by just a single point following a penalty try. Redruth’s Simmons and Matt Gidlow went over to put the home side back in control, but the Bees produced another response as Corey Venus dotted down. Aaron Simmonds’ penalty on 71 minutes made the score 29-20 to Redruth, but Nigel Hambly’s side were reduced to 14-men when Brad Howe was sent off. The Bees then set-up a tense final as Adam Nunney scored, but Redruth held on for the victory. For the second week running, Guernsey secured a late victory as they stunned Clifton keep their hopes of survival alight. Anthony Armstrong scored in the first-half for Guernsey, but Alex Lambert’s converted effort early on helped Clifton lead 7-5 at the break. It’s a WIN for the Raiders!! A last minute penalty and the conversion was good by O. Thomas. An Owen Thomas penalty and George Shannon’s try put the visitors in front on the hour, but Clifton looked to have snatched the victory on 77 minutes when Niall Gibbons dotted down. However, there was to be another twist in the tail for Guernsey as Thomas kept his cool to land a late penalty to clinch the win, which means Jordan Reynolds’ side are now 13 points from safety. Henry Bird scored two tries as Old Redcliffians’ resurgence continued after an excellent display against Old Albanian. Kieran Hill’s penalty put Old Reds ahead before tries from Chris Pursall and Bird, as well as another kick from Hill, gave the hosts a 20-5 half-time lead. The home side continued to punish OAs as Hill landed another three points while a penalty try and Bird’s second score sealed a fifth win from their last seven games for Old Reds. Matt Ramzanpour, Michael Hogan and Alex Chalcraft all scored for the visitors, who have now not won in six matches.